The Friedman BE sound has become the go to tone for those who want an extremely high gain version of the iconic British black and gold amps. Before that tone away was locked away in amps that easily cost over £1000, now you can get that tone in any kind of valve amp using just a single pedal. 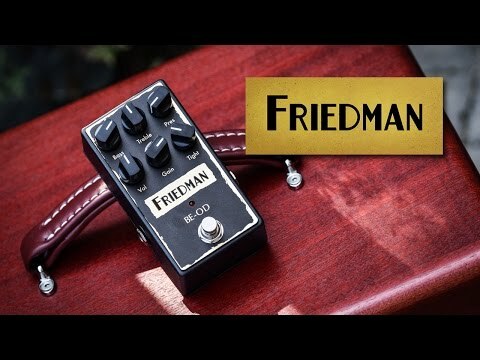 The Friedman BE-OD is an extremely powerful pedal that produces the exact tone you would expect with that BE branding. The original BE tone is over the top high gain madness with a refined British midrange and note to note clarity that is just unmatched. Somehow Dave Friedman managed to fit a tone that requires a huge valve amp in to a single pedal unit. That includes all of the gain that makes the amp so popular with everything from blues to classic rock and metal lovers. On the front of the pedal you have 6 controls that make it so easy to dial in your exact sound. On the EQ side you have Bass, Treble and Presence controls which all work very similar to how you would expect an amp to respond. Moving on to the other controls you have the usual level and gain controls as well as something called the tight control. This single control helps tighten up the low end for heavier sounds and give that tube amp like response. The BE-OD overdrive pedal captures the tone of the now legendary Friedman BE-100 amplifier which has graced the stages of world class musicians the world over. The BE-OD delivers authentic tube amplifier sound from a compact pedal with the controls needed to shape your tone including volume, gain, tight, bass, treble and presence. These responsive knobs will take you from light, slightly broken up overdrives to straight up gain nirvana. Built in the USA and designed to withstands decades of abuse the BE-OD is a must have pedals for any tone enthusiast. Volume, Gain, Tight, Bass, Treble and Presence.